As the creators of the iconic duo Ra and Ben, we can appreciate great company spokesmen. One of the all-time greats, of course, is the Michelin Man. But, have you ever wondered how this iconic spokesman came to be? Greatness takes time, and you may be surprised at just how far back in time the roots of the Michelin Man go. Here’s a brief look at the history of the Michelin Man, from his origins to today. While attending the Lyon Universal Exhibition in 1894, the Michelin brothers Edouard and Andre noticed a stack of tires that Edouard jokingly remarked as looking like a man without arms. However, an idea was born! Several years later, Andre met with French cartoonist Marius Rossillon, also known as O’Galop. The two collaborated and, using a rejected cartoon as a starting point, the Michelin Man was brought to life for the first time ever on this poster. The Michelin Man only grew from there. 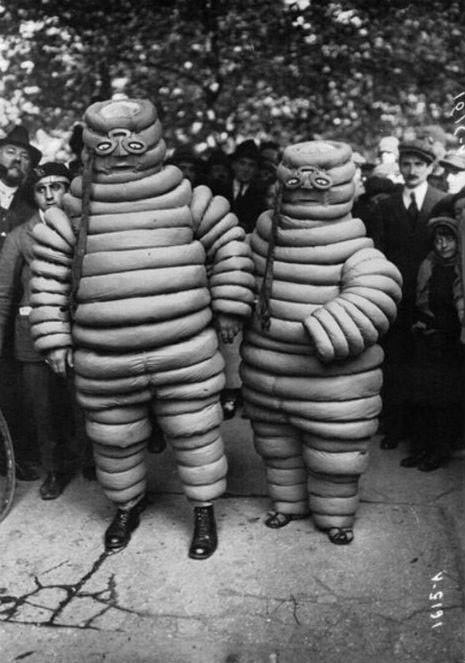 Over the next several decades, the Michelin Man, who adopted the name Bibendum, began to reach all corners of the globe. Michelin opened offices in London, New Jersey and Africa, among many others, and the Michelin Man was used in almost all forms of advertising. 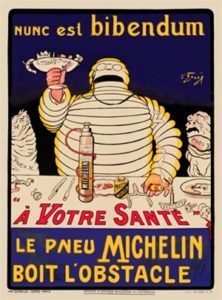 Bibendum, who originally appeared with a monocle and cigar, appeared on posters and began to adopt the persona of an educator, passing words of wisdom about Michelin tires and safe driving to customers. By the 1930’s, the Michelin Man dropped the monocle and cigar and was very close to resembling the final persona he appears as today. He even appeared in his first animated cartoon in 1935! This video only cemented his legacy, having already become a beloved fixture in the world of advertising. Although having begun as a high-society figure, over the years the Michelin Man became a jolly, helpful, every-man personality. As animation became better over the years, he became a little easier on the eyes to look at too. I mean, we love the Michelin Man, but it’s no debate that there have been some somewhat spooky renditions over the years, like these real-life Michelin mascots. Now thankfully always animated, this man made of tires is just as beloved and recognizable as any mascot you can think of and is always a presence in Michelin commercials. In fact, if you stop by your local Raben Tire, you will likely see him for yourself!